Nina's Time Out: I'm in Love! So made myself step out of my bubble a bit and give something new a try. And I love how it turned out. Lots of photos in this post! I used the sketch for the CropChocolate.com Challenge #11. And the inspiration photo from Moxie Fab's Trigger Tuesday. I love the colour palette and the birds. The stacking of the birds reminded me of a photo I had been wanting to use! So love the end result! I thought I would also share a few pics of the process. This is the canvas after I had inked it up a bit. I also stamped butterflies and clocks directly onto the canvas later on. Once I reached this point I left it to think about what I would like to add. I knew it would probably be flowers and then when I was doing my usual morning blog reading, I saw some great uses of butterflies on the Bo Bunny blog and knew I had to add some of those too! Nina! It is just simply beautiful! Great job!! Step out of your bubble more often :). The layout is stunning. Beautiful. The layout is stunning. Beautiful.... Ilove the colors and all the details so lovely. That is awesome! My sister gave me a canvas kit that has to be inked recently and I have to confess I do not know where to begin with inking canvas! Do you just do it directly from the pad or do you use a tool like a brayer? Caryn, I did a couple of different things. I used a spray mist directly on the canvas. I used Distress Ink by putting some on my craft and diluting it with a few spritzes of water and applied it with a paintbrush. And whenever I felt that there was too much ink anywhere, I either rubbed it with my finger or a piece of paper towel. There really is no wrong way to do it! You could apply it with a brayer. If you did it directly with the ink pad though, you may end up with lines from the edge of the pad. Which is fine if you want that look! Oh how gorgeous!!! WOW WOW WOW! Nina, your canvas piece looks Beautiful!! Love the layout, the gorgeous details and the pretty photo. Very, very pretty! What wonderful takes on the challenges! Very well done, Nina. We need to push ourselves now and then, don't we? Your canvas is stunning! Love the layout, the details, the colors, and the picture is awesome too. How lovely! You have done a terrific job. What a precious photo...three little birds indeed. Fabulous technique and a treasure for sure! Very pretty...love the background technique....so cool! This is beautiful! I love the background and the photo is darling. Oh, this is beautiful! 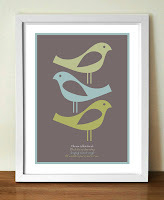 I love how your photo 'matched' the bird picture and that it triggered your whole project! Just everything about this is awesome! Nina, your canvas is gorgeous! I just found your blog thru the CC Blog Hop and I am so glad I did! I have been enjoying looking at all of your pretty cards and LOs too! I have been wanting to attempt a canvas and I hope you don't mind if I lift a few of your ideas. I really love the way you created your background, as well as all the flowers, butterflies and clocks! Thanks for the inspiration! Thank you so much Shalah!